Brew By Numbers have produced more coffee beers than your average brewery. 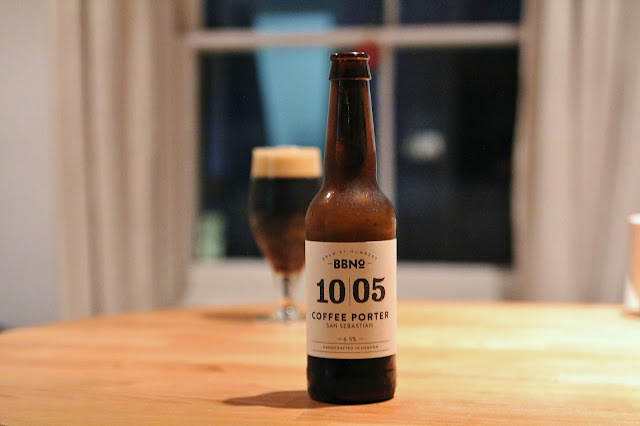 (Given co-founder Dave Seymour's past experience in the coffee trade, and a general passion for the drink from others at the brewery, perhaps this penchant should come as no surprise.) So far, BBNo have incorporated coffee into no fewer than seven of their beers, most notably porters, but also red ales. I recently tried their latest Coffee Porter, which incorporates, according to the brewery's website, "'San Sebastian' honey process red bourbon beans from Guatemala." The end result is a very nice beer. It pours deep brown with a frothy, mocha head. There is lots of milky coffee in the aroma, some well roasted malts, accents of scorched earth. The flavour is light-medium sweet, with strong, bitter coffee, bittersweet baking cocoa, more earth, some woody dryness. It's medium bodied with fine to average carbonation. Dry and bitter on the finish, there are notes of ashy roast, more baking cocoa, bitter espresso, scorched earth. If you enjoy hard roast and bitter coffee flavours, you will love this. Overall, it’s very good, although perhaps just a little lacking in depth.